Well, mom’s logic: Don’t say the truth; don’t answer with facts, do small talk!! BUT: never lie! Once she actually punished me as a kid when according to her I had lied about having brushed my teeth, she called it ‘manipulative character’. I ended up throwing up after being so scared by her predictions for my rotten character. When my dad walked into the dark room to see if I was well – my mum had left for a theatre play in the opera – he took a seat in my vomit and when my mum came home, he saw his trouser swimming in a bath tube full of soap and a manipulative child’s vomit. Yeah, I do remember all details! I pretended to be sleeping when my mum walked into my room to see why I had thrown up. “Can you do sit ups?” the photographer asks me next. “I think I do!” I say. And again I am just answering truthfully. Seems like I would be better at being a witness in court than communicating with people in everyday life. “JUST A JOKE” he says and his chubby belly is bouncing up and down giggling. While he is taking photos of me, touching my hair like it was the Barbie doll of his little daughter – actually I never had this feeling before of my hair being of plastic (awesome feeling: It’s like you watch yourself being a doll that is being combed) – he tells me to say sentences like “Black forest cake with cream and peanut butter” and since in between he asks me if I like peanut butter and I need a moment to think about it, on the photo it turns out I am rolling my eyes. On another photo I am pulling out my tongue because he told me to do so, and can you believe it? I really did it because I thought there was some weird purpose behind it. In the end, there is one photo out of ten that doesn’t look completely retarded. But I am honest with the photographer: “Well, I look like I want to work as a cashier. Let me come back tomorrow, maybe with the hair tied back.” We shake hands, I say sorry thousand times, and I leave the shop so quickly that I almost fall over my own feet. On the way home I take out my ID and realize I need to renew it and get photos for that, too. So I choose to get them done at these horrible cheap photo boots where you just throw the money in. The next one is located underground above the subway. It’s occupied by an Arabic family: Wife, husband, three small kids. The woman sits behind the curtain, I can see her legs and her hands on her knees. Her husband mumbles something, checks if it’s working, puts the coins over and over again. After a while he tells me to come and help him. 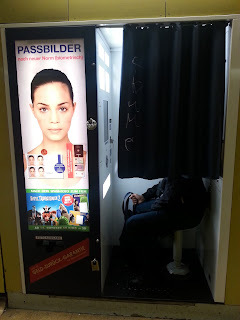 I put my head into the box and check if the lady is positioned right. She does not smile, in fact she is not allowed to, that’s the rule for those creepy biometric passport photos. Finally it works out, the next candidate is the three year old boy and the issue is we have to put a laptop and a bag full of pampers so that he gets into the right position. It takes fifteen minutes and ten trials to get the photos, but they actually look okayish. Then comes the baby, it’s maybe two months old. I am trying to explain to the father that he has to sit with it, but he wants to hold it up. He kneels down, I am trying to position its little head but it starts yawning and moving his head like a turtle, its hair is all black and wet from its baby heat, it has a red allergy around the neck and hardly opens its eyes. We give up after a while and print the shot where the eyes are closed. Needless to say they won’t accept that photo. Right when I want to enter the box myself, a new group arrives: Teenagers that seem to be speaking Arabic and a young German girl accompanying them, and then I realize: It must all be Syrians refugees who need to get pictures. Six euros for four pictures and I can tell you they are not worth one more penny. My hair looks grey and I have a shadow in form of a moustache above my pale lips.One of the Syrians gives a look at my photo, smiles at me and puts his thumb up. When I leave the underground I can hear the echo of their laughter fooling around in the photo box. Aber Angelika und alles gute fur das baby!